The amazonian herbal marapuama attenuates cognitive impairment and neuroglial degeneration in a mouse Alzheimer model. Riscos da associacao de Marapuama com anorexigenos em formulas para emagrecer. Effects of Marapuama in the chronic mild stress model: further indication of antidepressant properties. Marapuama traditionally and currently is a highly regarded sexual stimulant with a reputation as a powerful aphrodisiac. 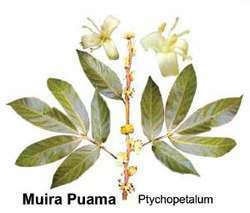 Marapuama (Ptychopetalum olacoides) is regarded as a "brain tonic" in the Amazon region and shows a nootropic profile in rodents. Aim of the study: Because a specific extract (POEE) of Marapuama was shown to possess promnesic and anti-amnesic properties, the aim of this study was to verify if POEE is also effective against [A[beta]. 2008) properties for a standardized ethanol extract (POEE) of Marapuama. Improved endurance to particularly stressful periods is one of the medicinal claims for Marapuama (Ptychopetalum olacoides Bentham, PO), a popular Amazonian herbal. Ptychopetalum olacoides Bentham (PO) (Olacaceae), known as Marapuama in Brazil and Muirapuama in other South American countries, is found in medicinal plant markets or as herbals in diverse formulations, usually sold to increase physical, mental and/or sexual performance. A substantial antioxidant property could be related to some of the therapeutic properties claimed to be associated with marapuama, as radical scavengers reverse the loss of spatial memory and decrease damage to brain proteins in aged gerbils and rats (Carney et al.